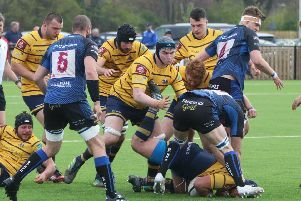 WORTHING Raiders Rugby Club sealed their seventh win in eight National 2 South matches with a 33-11 victory over Southend at Roundstone Lane this afternoon. It was Raiders first game since an emphatic 59-5 success over Lydney two weeks ago, after their scheduled match at Bishop Stortford last week was postponed due to snow. And Worthing picked up where they left off against Lydney to make it two home successes in a row. Southend took the lead inside a minute when Iain Meads pass found Mark Billings who went over to put his side 5-0 in front. Raiders responded well, though, and tries from Ben Dudley, Matt McLean and Callum Waters ensured the home side went in 21-11 ahead at the break. The visitors picked up the opening points of the second period on 43 minutes when Bradley Burr converted a penalty. However, those were to be the last points that they would register in the match. McLean went over for a second time before Nielsen bagged his 15th try of the campaign late on to ensure Raiders picked up their 13th win of the season. WORTHING: Storer, Miles, Sargent, Barlow, McGowan, Redmayne, Hewick, Smith; Waters, Leeming, Nielsen, Dudley, Loosmore, Greenwood, McLean. Subs: Walker, Whittall, Yates, Burns, Luke.